What is the Sea Breeze? The black arrows point to developing sea breeze thunderstorms. On two of them, you can clearly see a line of small clouds adjacent to the thunderstorms that mark the location of the sea breeze front. Have you ever been at the beach and noticed thunderstorms build in off the water during the afternoon? That is frequently the result of the sea breeze. You may have heard forecasters on TV use the term before. What is it? It’s all about temperature differences. The ocean absorbs heat from the sun much more effectively than land. The land surface gets hot during the day and cools significantly at night, resulting in large diurnal (day-night) temperature differences. The ocean, meanwhile, has a much smaller day-night temperature fluctuation. During the day, the ocean is significantly cooler than the land. During the summer, this difference is magnified and can cause a circulation to develop. 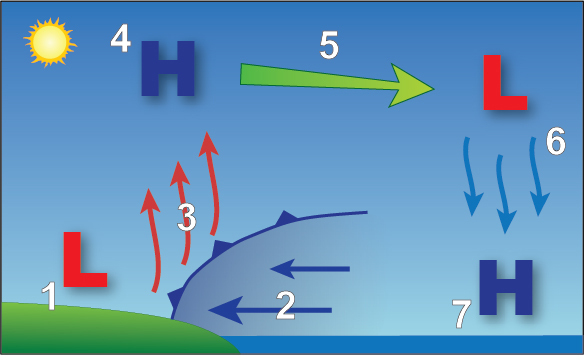 Schematic showing the sea breeze circulation and the development of the sea breeze front. Physics tells us that warm air rises and cold air sinks, right? Well, what happens during a hot summer day is that warm air rises off the hot land, leading to relatively low pressure at the surface. Higher up in the atmosphere, the air cools and settles, leading to higher pressure aloft. 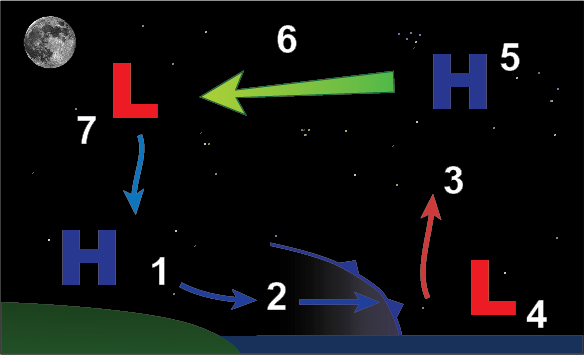 Over the water, the air remains cooler and sinks down to the surface and spreads out (diverges), creating relative high pressure at the surface and low pressure aloft. A basic rule of meteorology is that air wants to move toward areas of lower pressure, so in this situation, the differential pressure causes a circulation. The cooler, denser air mass over the water moves toward the lower pressure on land, clashes with that warmer air mass, and you get a small-scale front. As with a large-scale front, warm air is lifted over it and can generate thunderstorms in the right conditions, with the ocean providing a constant source of moisture to fuel the storms. As the front moves inland farther away from the coast, the temperature difference (or “gradient”) weakens and the front dies out, taking the thunderstorms with it. Schematic showing the land breeze circulation and the development of the land breeze front. At night, this process is reversed. The land loses heat much more quickly than the ocean, which results in the land being cooler than the oceans. This allows high pressure to develop over land and low pressure over the water, flipping the circulation and forming what is known as a “land breeze”. A land breeze is just like a sea breeze, except the front pushes off the land out over the water. Land breezes are typically weaker and don’t produce thunderstorms. This is because land breezes form in a more stable environment. The cooling land surface doesn’t allow for the lifting necessary for thunderstorm development and the temperature gradient in a land breeze situation is not as strong as with the sea breeze. There is also very little heating present and terrain features of the land surface (trees, buildings, etc.) block air flow from the land to the water. They can, however, result in cloud development. Unlike sea breezes, which occur predominantly in summer, land breezes are more common in the fall and winter, when nighttime temperature differences are the greatest. 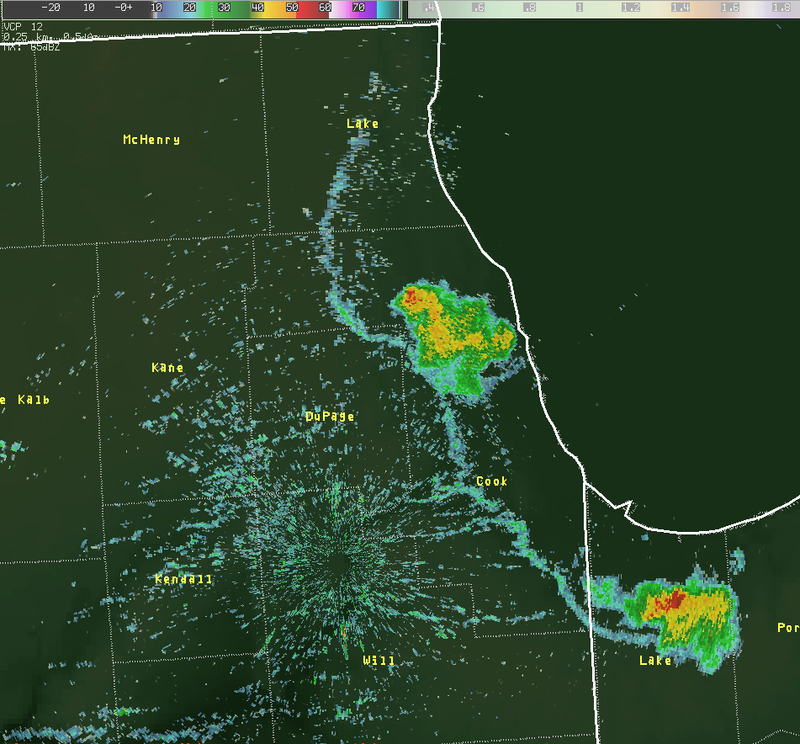 A radar image of a lake breeze event over the Chicago metro area. The lake breeze front is clearly visible as the blue line along with its attendant thunderstorms. This event was aided by a large-scale cold front and outflow from previous thunderstorms. The strength of sea breezes is significantly affected by the strength and direction of the prevailing wind. Prevailing winds off the water during a summer afternoon can strengthen the sea breeze and help it penetrate farther inland. 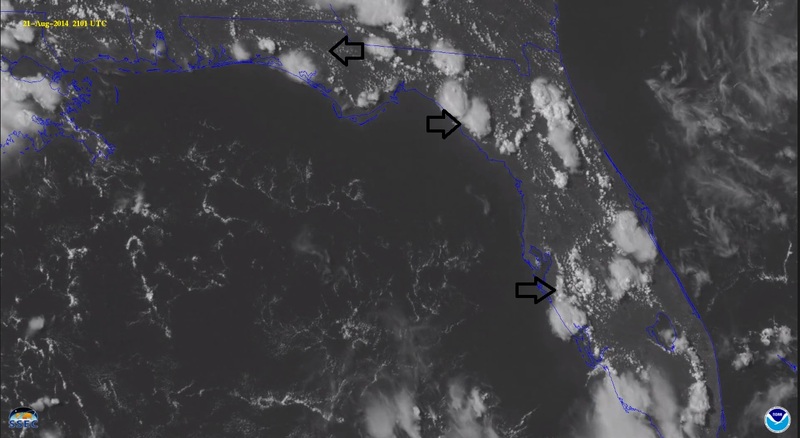 Light winds off the land, or opposite the direction the front is moving, can pin the sea breeze near the coast but also allow much more significant and widespread thunderstorm development. Stronger opposing winds, however, can keep the sea breeze over the water, thus preventing thunderstorms from developing at all. On smaller peninsulas, opposing sea breezes can actually collide and lead to very intense, though short-lived, thunderstorms. On larger peninsulas, the opposing sea breezes typically weaken before they reach each other. This phenomena isn’t restricted to oceans. Any large body of water can experience sea and land breezes. On the Great Lakes, they are known as “lake breezes” and can have exactly the same effects as their oceanic counterparts. Lake breeze thunderstorms are quite common during the summer along the Great Lakes and can be very persistent, due in part to the geography and wind patterns of the Great Lakes region. So, the next time you go to the beach, keep an eye out for this neat little phenomena. But remember to be safe about it. These storms don’t usually last long but they can be pretty nasty. “When thunder roars, go indoors.” You can always come back later. This entry was posted in Uncategorized and tagged educational, science, summer, weather. Bookmark the permalink.